You have probably seen in our stewardship center a table that advertises our Migrant Ministry. I remember last year a member of the parish telling me her experience of signing up for this ministry. What was it? What would it be like? She had questions, but went ahead anyway. And she came to love it. It’s a ministry of driving to Louisburg on Sundays, picking up seasonal migrant workers in their trailers, and taking them to mass at Our Lady of the Rosary parish in Louisburg. Did she need to speak Spanish? No. She only needed to be open to what the experience offered, which was an opportunity of encounter with some people she otherwise may not have known. Does this sound like something you might be interested in? Check out the stewardship center this weekend or look elsewhere in this bulletin for more information. This weekend is our wrap-up for our 2016 Bishop’s Annual Appeal. We will have members of our stewardship committee on hand to answer questions you might have about the BAA. 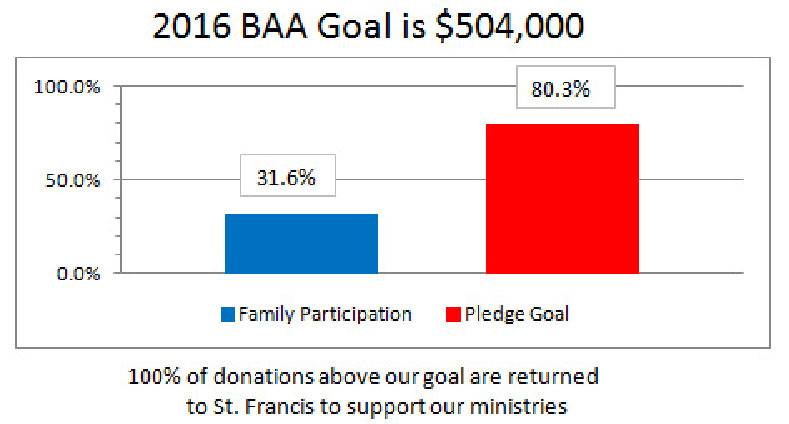 Our parish has done better this year than last, but we are still short of our goal as you see in the chart below. We thank all who have contributed, and if you have not yet contributed, we ask that you please consider making a donation. Thank you and blessings on your week! The Catholic Community of St. Francis of Assisi is seeking to fill the position of Coordinator of Finance for Schools, to start June 2016. The person will be responsible for oversight and management of financial operations for The Franciscan School and St. Francis Preschool. Ideal candidates should hold a bachelor’s degree in Business Administration or Accounting or comparable experience. They should have a positive and collaborative attitude and excellent customer service experience. They will also have demonstrated efficiency in handling multiple projects and knowledge of strategic planning. This position will report to the Director of Finance and Planning. This is a full-time position with excellent benefits and salary commensurate with experience. Interested candidates should submit an email letter of introduction and resume to Rob Neppel, Director of Finance and Planning at rob.neppel@stfrancisraleigh.org by June 3, 2016. PLEASE NOTE: We have recently been finding items such as old television sets, car seats, Christmas decorations, old house plants, and other items in our stewardship center and in other areas on our campus. Please note that we are unable to accept these items and have nowhere to put them. Church staff has been put into position of having to dispose of these items. PLEASE DO NOT LEAVE UNSOLICITED ITEMS ON OUR CHURCH PROPERTY. We thank you for your cooperation!